Today's post is by guest blogger Beth Seacord. Dihydrogen Monoxide. It is found in every lake, river and ocean. It is used in nuclear reactors, corrodes metal, burns human skin, and causes thousands of deaths each year. People responded with outrage and concern, calling for the ban of dihydorgen monoxide. Only later was it revealed that di-hydrogen (two hydrogen atoms), mon-oxide (one oxygen atom) is just plain water. 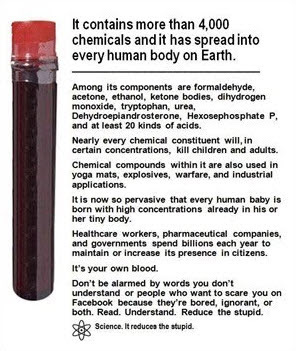 This ‘chemophobe’ meme implies that the ordinary person is gullible, scientifically illiterate, and because of this, overly sensitive and irrationally fearful of pesticides, artificial food additives, genetically modified organisms (GMOs), or other industrial byproducts that make their way into the environment and food chain. Attacks on the public’s aversion to industrial chemicals are not limited to social media. Frustrated scientists, industry representatives and risk assessors contend that if only the public understood the mathematics involved in calculating risk probabilities, they would realize there is no reason to fear ‘life-bettering’ bio-technology and chemistry. First, the value of accepting or avoiding a given risk depends upon the benefits associated with the risk. A person may rationally decide to expose themselves to a greater risk while at the same time choosing to avoid a lower-probability risk because of the benefits associated with each. For instance, I might choose to drive because I need to get to work even though I know that the leading cause of death or serious injury for those in my age group is automobile accidents. The same person who drives to work every day may rationally decide to avoid the lower-probability risk of BPA by using BPA-free water bottles. For example, this would be rational if there were no benefits to be gained by exposing oneself to the low-probability risk. Consider the following example given by philosopher of science, Kristin Shrader-Frechette: You are asked to play a game of Russian roulette where the chances of death are one in ten thousand. It is rational to refuse to play even though the chances of death are small because there is nothing to be gained by playing. Analogously, a person may rationally decide to avoid products with endocrine disruptors like BPA, for example, either because these products are not necessary or because there are safer alternatives available. Second, it is sometimes rational to view risks non-linearly if the risks are not morally equivalent. It is morally important how one comes to be exposed to a given risk. In other words, there is an important moral difference between risks that are imposed on us and risks that are voluntarily chosen. It seems perfectly rational to be much more averse to risks that are imposed on us without our consent than other risks that are voluntarily accepted. Citizens who are concerned about pesticide residue on produce, artificial food additives and un-labed GMO ingredients, or emission levels from the local factory are concerned about risks that have, in many cases, been imposed on them. It seems rational to have a non-linear risk aversion favoring chosen to un-chosen risks (see, e.g., Kristin Shrader-Frechette's Risk Analysis and Scientific Method). A second mistake made by the ‘chemophobe’ meme is that it is not clear that the probability of harm from industrial pollution and other toxins is low. While lifetime exposure for each individual toxin might be within acceptable limits, the combined effect of hundreds of environmental toxins may put us at significant risk. For instance, the Center for Disease Control estimates that about 144,000 cancer deaths per year can be traced to non-tobacco related environmental pollution. This accounts for about 30% of all deaths from cancer. Finally, there are vulnerable people in our population who are more susceptible to pollution than others. Women, children, workers, the elderly, the disabled and the poor are either more vulnerable to pollution or experience greater exposure. One need look no further than our current headlines. In Flint, Michigan the concerns of citizens about the water quality in the city were dismissed, belittled and mocked for months before journalists revealed corruption among the city’s officials. The citizens in Flint were told they were being paranoid. This week's post is by guest blogger Alexis Elder. Relationships between robots and humans have fascinated filmmakers and storytellers for decades. In Blade Runner, several human characters find themselves in relationships with replicants, androids so sophisticated that even they don’t always realize they aren’t human. On Star Trek: The Next Generation, Data is recognized as artificial by his crewmates, but accepted as a friend, which Data reciprocates in his own robotic way. Today’s robots are a long way off from such complicated constructs. However, relatively simple but appealingly cute robots are fulfilling companionate roles, from the robotic seal Paro, who keeps senior citizens company in nursing homes, to NAO, a little humanoid robot that holds users’ hands and retrieves small items. Deciding whether Rachel from Blade Runner could be a friend might require us to decide whether she’s a person, introducing thorny questions about what that involves. Data might just be an example of what it would take for a robot to be both a person and a friend. But there is another character in Blade Runner whose situation more closely parallels ours: the eccentric inventor J.F. Sebastian. “Not really,” he replies. “I MAKE friends. They're toys. My friends are toys. I make them. It's a hobby.” And he does. His living space is populated by an assortment of creatures much closer to Paro or NAO than Pris or Rachel. Is J.F. right? Are his toys his friends? What should we think of his claim that he isn’t lonely because he’s got them? These questions aren’t merely speculative. Robots are being used in nursing homes and extended care facilities to alleviate patients’ loneliness, and research suggests that they are effective: patients report less subjective loneliness after interacting with them, and show fewer physical markers of stress. But although I am a fan of using technology to improve our lives, I have a worry about these technologies, one that dates back to well before we started telling stories about robots. Is what they provide an improvement, on balance? Grant that these robots can make people feel less lonely. May they, in doing so, introduce another problem? To answer this, we need to think a bit about the value we place on social relationships versus the feelings they induce in us. Aristotle claimed that “without friends no one would choose to live, though he had all other goods”. Even if he overstates the case a bit, what he seems to have meant is that, given the choice, we would opt for a life with friends over one that included all the other goods but no friends at all. In that spirit, imagine being given a choice between two lives. You know at the time of the choice how the lives will differ. But once you begin your chosen life, you will forget – it will be as though things have always been this way. In one option, the people you consider your friends are actors, although if this life were chosen you wouldn’t discover their illusory nature. These friend-facsimiles would not use the appearance of friendship to exploit you, or betray your confidence. But neither would they care for you or find pleasure in interacting with you. Call this the Truman Show option. In the other life, your closest friends are exactly as they appear to you to be. Call this the Genuine option. It is my guess that most of us would prefer Genuine over Truman Show. Feelings of loneliness can be relieved in many ways, from taking Tylenol to a hot shower, without addressing social isolation. But when lonely patients are at risk for cognitive disorders, social-robotic interventions may be ethically bad. They work because they look and feel enough like companions that they hit the right emotional buttons, in populations that are already predisposed to confusion. A good movie can hit one’s emotional buttons without being immoral. But social robots are different here, because lonely and compromised residents of long-term care facilities are not in a good position to distinguish the genuine article from a compelling facsimile – one that makes them feel like they’ve got a friend. when a man has deceived himself and has thought he was being loved for his character, when the other person was doing nothing of the kind, he must blame himself; when he has been deceived by the pretences of the other person, it is just that he should complain against his deceiver; he will complain with more justice than one does against people who counterfeit the currency, inasmuch as the wrongdoing is concerned with something more valuable. Causing lonely patients to think they have friends when they don’t makes us counterfeiters of something more important than money. This seems like something we ought to avoid. · Being aware of individual patients’ susceptibility to mistake robot “friends” for real ones. Until robots are capable of real friendship, designing and using them wisely and well will require us to avoid manufacturing false friends. Editor's note: In case you love this topic, today on The Splintered Mind, Eric Schwitzgebel writes on an overlapping theme. The problem of making fully conscious robots that will always cheerfully sacrifice themselves for humans.